DEP Secretary Kathleen McGinty found! 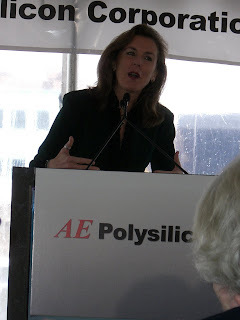 In AE Polysilicon Event Groundbreaking – Part 2, I speculated about the absence of Pennsylvania Department of Environmental Protection (DEP) Secretary Kathleen McGinty from the AE Polysilicon supplied photos. 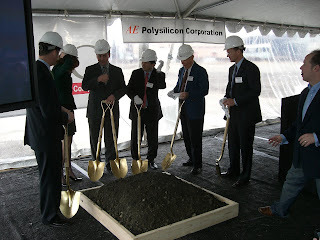 AE Polysilicon responded with a few more photos. Both Secretary McGinty and 8th District Congressman Patrick J. Murphy (D-PA) spoke to celebrate the AE Polysilicon groundbreaking. Companies like Spanish windmill manufacturer Gamesa and solar material manufacturer AE Polysilicon have already moved into the KIPC and created hundreds of jobs. By virtue of an office at the Keystone Industrial Port Complex (KIPC) Administrative building and activity at the existing structure, this statement was true in technical fact. 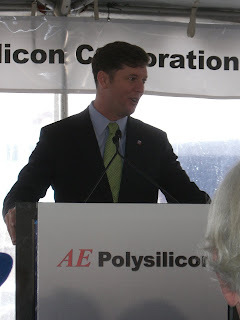 However, I still believe Congressman Murphy’s staff was being a bit over enthusiastic about AE Polysilicon’s progress last October. Gamesa USA, a Gamesa Corporacion Technologica S.A. subsidiary, today employs over 500 people manufacturing wind turbine blades, towers, and assembling nacelles at the KIPC. Per Gamesa ends 2007 by signing several contracts of wind turbine supply for over 700 million euros, their wind power business continues to boom. Enough with the photo web log! I will return to the normal Blog format in the next post.